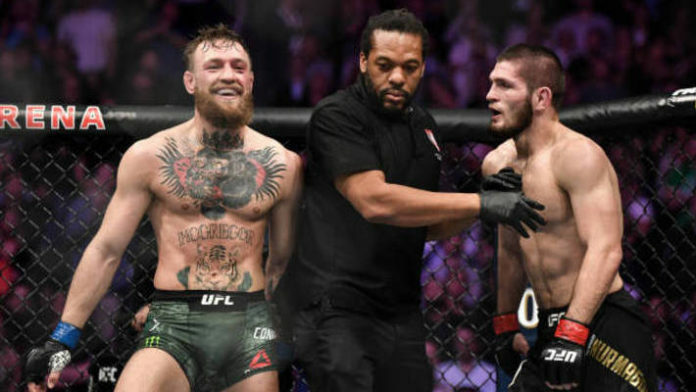 A renowned coach claims Conor McGregor committed several fouls in his fight with Khabib Nurmagomedov, but wasn’t warned for them. McGregor and Nurmagomedov collided last Saturday night (Oct. 6). McGregor was in search of his second Ultimate Fighting Championship (UFC) lightweight title run, but fell short. He was submitted in the fourth round. It was the “Notorious” one’s first mixed martial arts bout since Nov. 2016. “I know Herb Dean. He’s a great referee. The man’s a professional fighter as well, he knows what’s going on in there. He understands jiu-jitsu, he understands striking. But McGregor got away with so many fouls. To the point that Khabib — he left his corner between round three and four to tell the ref ‘hey, why are you letting him get away with all these things?’ First of, the worst foul: he kneed Khabib illegally from the bottom. Khabib was in side control and McGregor knees Khabib in the head from bottom side control. He should’ve gotten a stern warning, or maybe even a point (deduction). This isn’t the first time Zahabi has spoken unfavorably of McGregor following UFC 229. He also said that Nurmagomedov “bullied a bully” in McGregor. It’ll be interesting to see if McGregor or anyone from SBG Ireland responds. Did you notice Conor McGregor bending the rules at UFC 229?